At our former shop, in the middle of the "concrete jungle", I met a stray female cat and started feeding her. Soon she gave birth to a litter of kittens in an abandoned van in the parking lot. Several of them found homes with the other tenants in the industrial building. Naively, I thought that I could make friends with her and take her to the humane society to get her spayed before more kittens came......This was not going to be too easy! 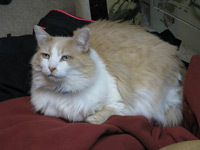 Wiley-O prides himself in his beautiful long-haired (mostly) white coat. The privileged human might even be allowed to brush him now and then. 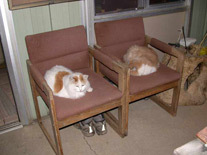 Raja and Wiley-O are at their posts in the two chairs on the porch. In their younger days, any unwary cat or dog that came around was escorted away immediately. Now, in retirement, they use descretion and run into the shop if danger approaches. 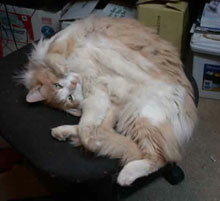 Here's Wiley-O "all fired up" with energy like a kitten. He's ready to pounce on a masking tape ball on the end of a "cat-fishing rod". He says "you're only as old as you let yourself be". Raja, the king of the forest. (after all he is the right color). Meanwhile, he will have to settle for mice. 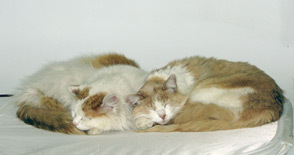 Having both used up more than a few of their nine lives, The Boyz feel that life is too precious to waste. Momma-Cat gradually began to trust me enough to come into the shop for food, and she even hung around keeping me company sometimes. But things didn't happen nearly fast enough. Before long, she was bringing 2 strong, weaned kittens around with her for the food. I had one bowl of food outside, and another one all the way inside, against the far wall of the shop, next to the bathroom and machine shop. One kitten followed Momma-Cat around and came with her into the shop for food. The other kitten was very proud of his survival skills, and only gave me brief glimpses of his dissappearing act. He ate outside when nobody was around. One day, I grabbed Momma's "companion" while he was eating, and threw him into the bathroom before he knew what had happened! I was due to leave on a camping trip in my van in a few days, and didn't want to leave the little guy locked up alone, so I took him with me. He found an ingenious hiding place inside of the dashboard wiring where I couldn't possibly get him out, but during the night when I was sleeping he came out and made friends with me. After that week in the van, he was playing with my shoes and purring loudly while he slept with me. I named him Wiley-O after a cat that I had just lost who was named Red (sometimes called O'Red O'Reilly or Wiley O'Reilly). 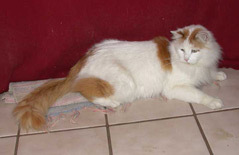 Wiley-O has the beautiful orange tail that Red always missed out on (he was a Manx). Wiley-O grew as our friendship grew. 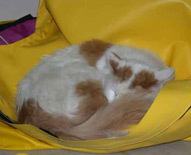 He was a natural-born domestic cat. I knew this for sure when I was traveling with him in the car, and he escaped out of the partly opened window while I was stopped for gas. Wiley-O the domestic cat ran for safety into the gas station. Raja says: had it been him, HE would have run for the woods, where wild animals belong. "Big Brother" as I called him then, was doing very well, thank you very much, as a feral cat. He was glad of the free food, but he knew that his hunting skills were good enough to support him and he had no intention of coming indoors like Wiley-O. It was obvious that if I wanted to control the cat population in the neighborhood, I was going to have to do more than be friendly. As it turned out, the local humane society had a program for keeping the feral cat population controlled without having to kill them. They told me that if I trapped the cats, I could get them spay/neutered for $5 each. And the kittens had to weigh 4 lbs to be "ready" for the operation. So, when Wiley-O reached 4 lbs, I rented a Have-A-Heart trap for the week and trapped them one by one: Momma-Cat, Mrs. Knucklehead (another reproducing female), Grey (an adult male who I never saw again), and of course Wiley-O and his Big Brother. Most of the cats were set free after the operation. Mrs Knucklehead apparently was nursing kittens. But I had other plans for Big Brother. I thought he would soon become tame, like Wiley-O did, and that I could find a good home for him. After all, one cat was enough (or so I thought). in being part of the family. His habit of striking a haughty "king of the forest" pose earned him the new name "Raja". What about my plans to tame Raja and find a home for him? This was obviously not to be. For one thing, he was not one to be tamed quickly. This meant that by the time he was ready for someone else, he would be a full grown cat (maybe even an old cat, from how things were going) and not a cuddly cute little kitten. It also meant that I became so fond of him that there was no way I would consider giving him away. And then when he was a year old, his kidneys failed and he had to be put on that special low protien cat food for kidney patients. Besides, the two brothers clearly wanted to stay together. Having just lost a cat to a car accident on the road next to the shop, I wanted Raja and Wiley-O to be indoor cats. This lasted until they were about a year old. I had hoped that after growing up indoors they would "forget" about the outdoors. These cats had spent too much time outside as kittens to be willing to stay indoors all the time. They waited near the door for any opportunity to get out. I had to train all of my friends to shut the door right away. Then summer came and I wanted to open the door and let the delightful Colorado air come in. The realization came to me that in order to force the cats to become indoor prisoners, I would have to make myself a prisoner as well. The humane society and vet doctors always say that cats should be kept indoors because they will live longer. So Raja and Wiley-O asked me if I would be willing to stay indoors all the time if I could live longer...... That was the end of the "indoor cats". Their momma taught them well, and their hunting and self-preservation skills are the equal of any wild animal. I decided that I was going to have to accept them being the creatures that they were created to be, and take the chance that they might not live as long. I would want nothing less for myself. It was a full year after I got him before Raja would allow me to reach out and stroke him without it having been his idea first. When they were about 2 years old, Wiley-O discovered jumping up on my lap while I was sittiing down. It was another year before Raja would do that. Until they were about 3, the people who watched the cats while I was out of town would never see them at all. When the boys were 3 years old, David moved in. Raja welcomed him right away, but Wiley-O was not so sure that he wanted to share me with anyone. So David began the slow process of earning their trust and friendship. In 2003 we almost lost Wiley-O to peritonitis. He went through two rounds of abdominal surgery and daily visits to the hospital for almost a month. He was back to being a normal cat after a couple more months, just in time to enjoy the summer, but it was a full year before he again weighed in at his pre-surgery weight of 10.6 lbs. Every time I see Wiley-O roll on his back in the Colorado sunshine, or enjoy life in many other cat-ways, I am reminded of how precious the miracle of life truely is. He has taught me to be thankful for each and every day of my own life, and to "be there" for the simple things that make life great. Momma-Cat lived for several more years, until about age 12, but never was tame enough to be held or taken willingly to the doctor. At 10 years old, Raja and Wiley-O are almost as tame as can be expected of cats. They still are shy with strangers, but don't always do the dissappearing act when someone comes over. If I ask them to, they will allow a stranger to meet them. The biggest change is that we now hear from the cat-sitter that Wiley-O really enjoys her visits and Raja has even been known to purr with her. In 2006 the Bubonic Plague moved into the prarie dog communities in rural Boulder County. The field behind our shop that used to be teeming with prarie dogs and rabbits was uninhabited. To keep the cats from becoming infected, we asked them to stay indoors for the summer. Raja had the hardest time of it, but we all adapted. Extensive remodeling was necessary to keep the cats in contact with the world. After the county said the danger was lessened, we agreed that the boys should be allowed out. But some compromise was agreed upon. I had noticed how my anxiety level dropped when I no longer had to worry about the boys being in danger from owls, coyotes, mountain lions, and eagles here at our new place. The old shop was in the city and there were very few predators besides cars. So Raja and Wiley-O agreed to be indoors at night. After all, they are getting to be retirement age and deserve to take it easy. As the years pass, we all deepen our trust and love for each other. These cats have taught me the value of relationships and how great the rewards are that are earned by great effort. I have imposed my own style of love and affection on them, and they have done the same to me. Nothing is guaranteed, but love and friendship can be earned and shared by those willing to give. Who could even consider finding another home for such a cat?? ?